When you experience pain in the left side of your chest, it can cause you to be alarmed. One of the first things that you may assume is that you are having a heart attack. While this could be a possible cause of your left side chest pain, there are other possible reasons for it happening. Some of these conditions can be dangerous, so it is always important to go to your doctor. While it may be due to a less dangerous cause, a heart attack is still a possibility. If you think that you could be having a heart attack, seek professional medical care immediately. 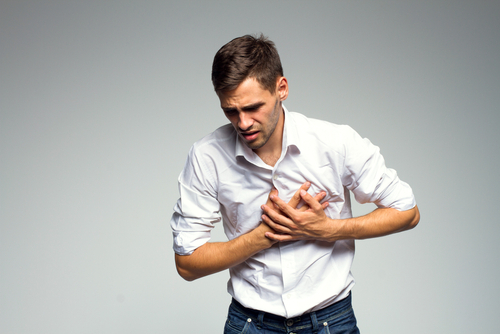 A heart attack is medically known as a myocardial infarction. This condition happens when your arteries are clogged. Normally, your heart works around-the-clock to make sure that oxygenated blood and nutrients reach all of the tissues in your body. Over your lifetime, plaque may start to build up in your arteries. When this happens, you may end up having a heart attack. If your heart can not get oxygen-rich blood, then it will stop working the way that it is supposed to. In some cases, it may stop working completely. If the blockage does not naturally clear within 15 minutes, you will most likely notice a pain that starts on the left side of the chest and begins to move to your left shoulder and neck. This is because tissues in the heart are starting to die, and your body is not getting the nutrients and oxygen that you need. If you are having a heart attack, call 911 or go to the emergency room right away because heart attacks can be life threatening. There are lifestyle factors that can end up causing chest pain. Stress can cause pain in your chest, although it is important to make sure that the underlying cause is stress and not a heart attack. Diabetes and obesity can also cause pain in your chest. Both of these conditions can cause chronic medical problems and other issues if they are not taken care of. Eating a balanced diet, getting exercise, avoiding smoking and limiting your drinking can help. Costochondritis is a condition where the costosternal joint becomes inflamed. This joint is located where the sternum and ribs connect. If this joint is inflamed, then you may experience sharp, localized chest pain. Often, this condition is caused by a viral infection or chest trauma. It can feel worse after physical activity and is common among young adults and children. Costochondritis can be treated by anti-inflammatory medication and physiotherapy. Among middle-aged adults, angina pectoris is one of the most common causes of left side chest pain. 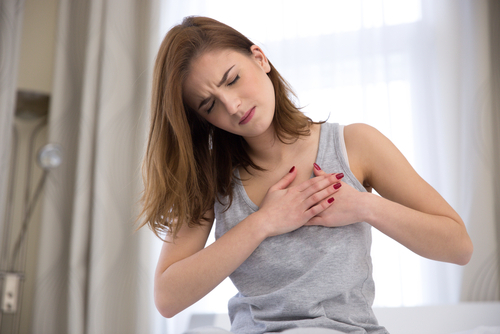 When you have angina pectoris, it can feel like there is a constriction or a tightness in your chest. It feels like pressure is building up, and the pain can spread to your shoulder, lower jaw, arm and back. There are less serious causes of left side chest pain. A left pectoral strain generally happens to athletes who play contact sports. It can also happen if you are involved strenuous exercise. Basically, you have strained or torn your pectoral muscle. The pain can spread to your armpit and shoulder if you continue to exercise or involve yourself in physical activity. If this is the cause, then you will experience pain when you touch the painful spot on your chest. In general, this condition can be treated by resting and taking over-the-counter pain killers to handle the pain. There are many different respiratory tract problems that can cause left side chest pain. Chronic and acute conditions can cause pain. Some of these conditions include cancer, tuberculosis, asthma, lung abscesses, pneumonia and bronchitis. Depending on the condition, you may experience shortness of breath, a cough, a fever or sputum. You should seek treatment from your doctor to make sure that the illness does not worsen. Cardiac ischemia refers to a condition where you heart is not getting enough blood. If the condition is not treated, it can lead to serious problems like an irregular heart rhythm, a heart attack or heart failure. Before long, the muscles in your heart will become less effective as they become damaged. The most common sign of cardiac ischemia is chest pain. Pleuritis is a condition that happens when the lining in the lungs is inflamed. When you have pleuritis, you may experience coughing and breathing problems. Whenever you cough, sneeze or breathe, you may feel pain on the left side of the chest. Pleuritis is often caused by a viral infection, pneumothorax, a bacterial infection or pulmonary embolisms. If this is your medical condition, you need to go to the doctor to find out the underlying cause. Depending on the cause, you ma be treated with options like anti-inflammatory drugs, pain killers or other options. Intercostal neuralgia is a condition that effects the intercostal nerves. These nerves are between your ribs within the chest. Sometimes, they may become injured because of a trauma or an infection. The pain may feel like it is shooting, sharp or stabbing pain. When you laugh, sneeze, breathe or cough, it can cause the pain to worsen. Intercostal neuralgia is unfortunately extremely difficult to diagnose and cannot be detected by an x-ray. It is generally only diagnosed after every other possible cause has been eliminated. Gas, stomach acid and heartburn can cause chest pain in the left side of your chest. The pain can be mild or severe. When there is too much gas or acid build up in your intestines, it can cause pressure in your chest area. You may also experience flatulence, abdominal pain or bloating. Since this pain is similar to the pain of a heart attack, it is important to go to the doctor to make sure that you are not actually having a heart attack. Sometimes, a hiatal hernia can form when some of the stomach pushes upward into the chest through the hiatus. While you may not experience any symptoms, you could also experience symptoms like heartburn, chest pain or acid reflux. If you are lying down, your symptoms will often worsen. While the pain may subside on its own, severe cases may require surgery. Some causes of left side chest pain are less common. Several organs are just beneath the chest, so these organs could be responsible for the pain. You could also be suffering from spleen pain, kidney stones, gastritis and kidney infections. Previous articleWhy Do My Balls Hurt?